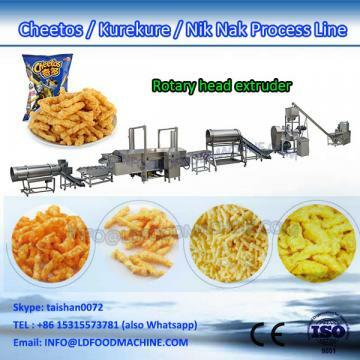 Popular corn twist curl snacks is a kind of special extruded snacks, very crunchy and great in taste. 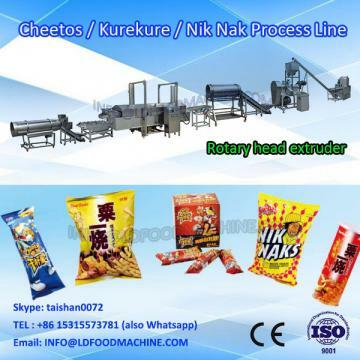 They are made by nik naks extruder machine. The corn grits is moisturized in the flour mixer with water and fed to the Rotary Head Extruder.In the extruder, d ue to the two rotary plates made of yellow brass,the corn grits are squeezed and twisted to form curls shape.The curls pass through the die and gets cut by the cutting knifes into required lengths. 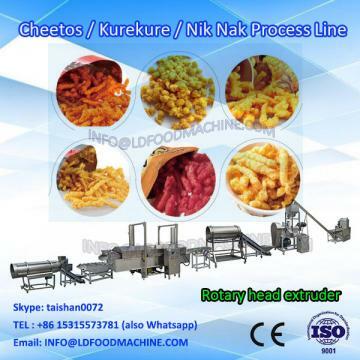 There are two ways for making corn twist curl snacks, fried way and baked way, for your choice. 1. Easy operate.Automatic machine just operate with the button. 2. Long life.We use stainless steel 201 as the material,never rustting. 3. Best motor.The motor are world famous Siemens,can use long time. 4. New design.Every details we cares about-the Coil arrangement and Code etc. 5. Mould design. Precision to the design of a millimeter according to your shape need. 6. Supporting tools.We can offer the tools free. 7. Easy cleaning and low electric cost.